Spirit is our primary focus. One of the things we have in common is that we were all Spirit Chiefs of the men’s community. We show up and create ceremony and sacred space. We have all been leaders (Vision Keepers) of various EBCOM events. Our team is intuitively based, we relay on our intuition, rhythm, creativity, love, and soul journey work. We are also interested in supporting young men in their passage into being men. We meet weekly and trade off team lead seasonally. Clayton, Mark and Bruce share art studio/ creative space where they occasionally have open studio events to showcase their work. Garner: retired spirit chief, past community service chief, first crab feast fundraiser team for Thunderoad, Christmas in April leader (community building project), performer of many a baby blessings, family campout vision keeper “Magic Village”, holds space at many healing ceremonies, new storyteller, and passionate drummer. Garner is a designer and “red beaver” builder of awesome homes and spaces. Mark: vision keeper fall event “Seeing with Different Eyes”, inspired by EBCOM to create the nonprofit Drawing on Earth (www.drawingonearth.org) their first project set a Guinness World Record for the largest chalk drawing, the production team was primarily the East Bay Circle of Men. Family campout vision keeper, “The Gift,” Halloween party co-vision keeper, and he knows Iktome (outside joke). Mark is a visual artist, digital and traditional, teacher, author, musician, dad, lover of circles, and a devoted ceremonialist. (www.heartsandbones.com ). 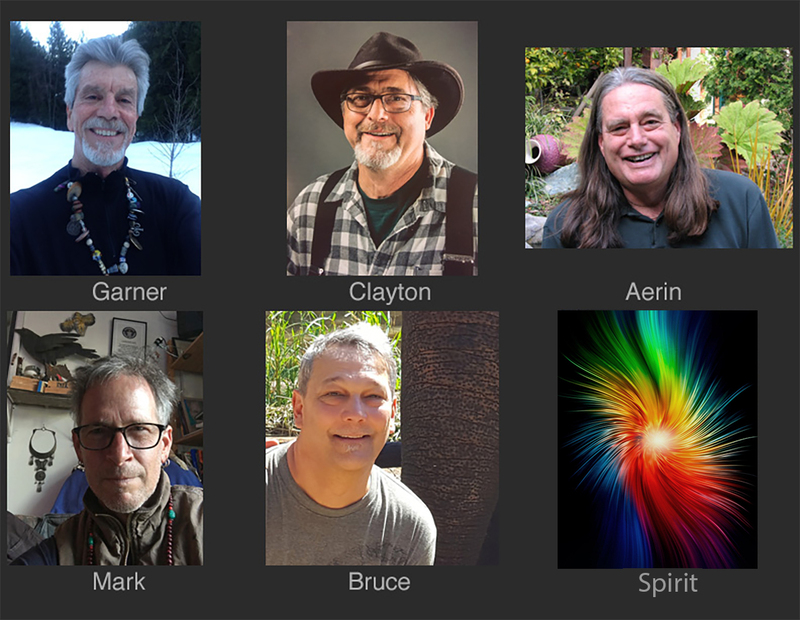 Bruce: is the current spirit chief of the East Bay Circle of men. He is a smoking hot 3D motion graphic artist and internationally known world class drummer. He’s traveled all over the world as a master dive instructor and knows his coffee (Hawaii). Fall Event vision keeper 2012. His latest passion is sailing and learning all the nuances that come with traveling the seas.